Matthew J. Milliner (Ph.D., Princeton University) is Assistant Professor of art history at Wheaton College. There are still a few Christian Christmas-crashers out there, accusing the holiday of "pagan origins." They begrudge December exuberance, are not entirely wrong, and are in good Puritan company. The problem is that consistent fear of "pagan origins" invalidates the Bible entirely, even in its original tongue. Hebrew, after all, is of Canaanite stock, and Greek -- the language of Hesiod -- fares no better. God may have created the world ex nihilo, but revelation -- while still being a word from without the cosmos -- is comprised from stuff within. Even the word "gospel" affords no escape, as the term evangelium, "good news," was first used to announce the presumably "good news" of new reforms and regulations issued by Julius or Augustus. Christians, of course, subverted this message and offered the actual good news of forgiveness and -- incredulity be damned -- even life eternal. Advent is no different. 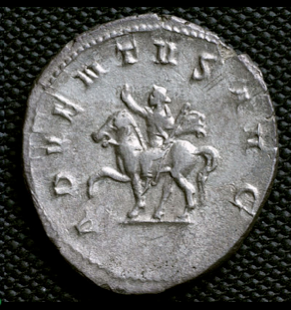 Ancient coins celebrated the "ADVENTUS" of the Roman emperor, announcing his triumphant arrival to the lucky residents of a given city. Christians subverted these pagan origins as well, claiming that the real advent worth celebrating is the coming of the universe's true Emperor as a tiny babe. But as much as the quest for a "pure," 100 percent pagan-free Christianity is a red herring, I wouldn't mind the assistance of any remaining Christmas-crashers to help curb at least the most egregious of our premature Yuletide celebrations. Are the 12 days of Christmas so inadequate that they need now be 72? Advent, that disappearing, four-week season of waiting that anticipates the first and second comings of Christ, is of course under far greater threat than Christmas. And because judgment is a prominent Advent theme, the season's eclipse mirrors the eclipse of hell and the end of the world in at least some evangelical conversations. But here, strangely enough, is where the very people accused of polluting Christianity can assist in its rehabilitation. Numerous neo-pagans, based on a facile interpretation of the richly complicated Mayan calendar, anticipate cosmic judgment being poured out on our hopelessly materialist society on Dec. 21 of this year. This makes what Rolling Stone called the new psychedelic elite at present more liturgically correct -- in their eschatological focus -- than the prematurely Christmas-crazed faithful. The same goes for an Aztec inscription they also investigate: "The message was: Aztec rule is an integral facet of the current world, as it should be; this world is not about to end; on the contrary, it and its rulers are here to stay..."
Tirelessly brilliant, MacArthur Prize-winning minds (watch the documentary) have poured themselves into deciphering Mayan glyphs over the last decades, and have only recently succeeded in cracking the code. But the results, spiritually speaking, have been less of a big bang than a thud. The glyphs offer no hitherto concealed meaning of life, no gospel, no saving advent. Instead, they offer history's equivalent of a rerun: the Roman "good news" all over again -- a gospel of political permanence and imperial might. Because the Mayan calendar was not linear but cyclical (see David Hart on that point), Restall and Solari rightly infer that "the 2012 phenomenon is not ultimately about the year 2012, or about the Maya. It is about the apocalyptic impulse that lies deep within our civilization." That impulse, of course, is a Judeo-Christian one, making neo-pagan apocalyptic fervor an unintentional projection of a feature of Western Christianity that many Christians have lately seen fit to ignore. But it gets even stranger. What puzzles Restall and Solari is that Mayans themselves were drawn to the Judeo-Christian perspective on the end of days and last judgment, apart from colonial pressures. The Chilam Balam are Mayan-made texts from the Christian period; they fuse Mayan and Latin culture, but were meant exclusively for Mayan readers. In one of them, entitled "Fifteen Signs before Doomsday," Christian eschatology is fully embraced. As to why this might be, Restall and Solari are at a loss. They insist that it can't be as simple as Mayans "succumbing to colonial forces." Perhaps, they suggest, Mayan embrace of the Christian apocalypse was "a socially savvy way to maintain cultural continuity amid the psychological trauma of the early colonial period." Fair enough. But equally plausible, and certainly a more direct explanation, is that the Mayans felt the teleological time given to them by Christians was more satisfyingly true. And if one thinks the indigenous embrace of Christianity on native terms far fetched, there are two beautiful and massively learned books by Meso-American art historian Jaime Lara that exhaustively suggest otherwise (and a third volume is on the way). This is not to let the conquistadores off the hook -- far from it. Part of the Mayan attraction to Christian eschatology may have come from the fact that final judgment is a remarkably effective way of reminding colonizers of the consequence of exploitation. 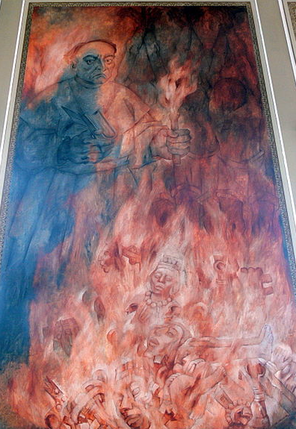 According to Andrew Wilson, this was exactly the message of the Advent sermons of Antonio de Montesino, aimed at colonial aggression, and made famous by his fellow Dominican, Bartolomé de Las Casas: "All of you are in mortal sin," railed Antonio, "and in it you are living and are dying because of the cruelty and tyranny with which you treat these innocent people..." Perhaps this is one of the reasons why hell is so prominent in colonial Mexican churches -- because in the demand for justice, damnation was a native ally. 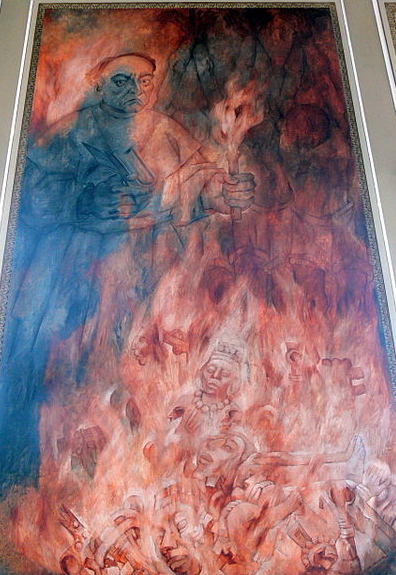 Nor was this lost on the 20th-century Mexican muralist Fernando Castro Pacheco, whose hellish portrait of the controversial 16th-century inquisitorial bishop, Diego de Landa, makes the same point that Dante did by including bishops in hell. God warns of judgment for unjustly oppressive colonizers no less than for any natives who still surreptitiously sacrificed their children. "A true opium for the people," wrote Czeslaw Milosz, is "the huge solace of thinking that for our betrayals, greed, cowardice, murders we are not going to be judged." Sophisticated evangelicals, over-correcting the "Left Behind" series, may be tempted by such dope. Meanwhile, 2012 enthusiasts, like the Mayans before them, long for good old-fashioned eschatology. With their surprisingly seasonal, covertly Christian expectations of doom, contemporary neo-pagans remind us (at least this December) that judgment draweth nigh. Even while countless Christmas carolers forget.